Our Windsor 4 Carat Pear Cubic Zirconia Marquise Cluster Drop Earrings will be an elegant addition to your fine jewelry collection. 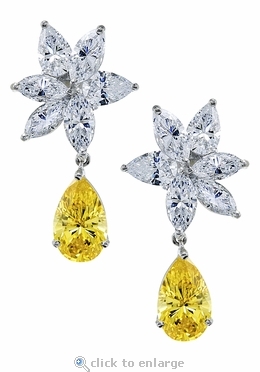 A stunning intense vivid yellow canary diamond look 4 carat 13x9 mm pear cubic zirconia drops from a cluster of 1 carat and .75 carat marquise diamond quality cubic zirconia stones in addition to 1 carat pear cubic zirconia stones. 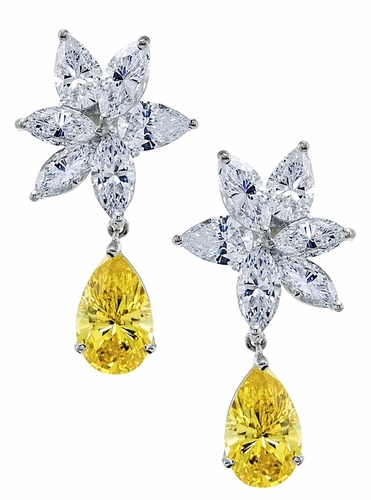 The cluster top has a starburst effect with a sunburst canary yellow tear drop pear that hangs and moves freely. The pear drop can also be custom made in any color stone that we create like red ruby, blue sapphire, green emerald or pink diamond look as well as white diamond look colors. Each setting that houses the stones is set in hand made basket settings, giving that look of old world high end craftsmanship. Each of the diamond simulant stones are hand cut and hand polished to exact diamond specifications and include approximately 19 carats in total carat weight for the pair. 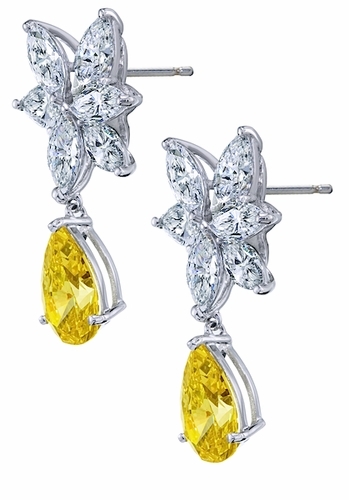 These cluster earrings measure approximately 35mm in length. Choose from 14k white gold or 14k yellow gold with standard push backs or upgrade to large backs for added comfort and security. If you prefer 18k gold or Platinum, they are available via special order. Please see the pull down menu for options. For further assistance, please contact us directly at 1-866-942-6663 or visit us via live chat and speak with a knowledgeable representative.